In pre-colonial times, the present day area of Republic of Côte d'Ivoire included part of a number of states, including the Gyaaman, Kong Empire, and Baoulé. Côte d'Ivoire became a protectorate of France in 1843–1844 and a French colony in 1893. During colonial rule, France promoted the development of agricultural plantations along the coast, using forced labour. Côte d'Ivoire won independence in 1960. In the first decades after independence the country was notably stable and the economy grew rapidly, while it maintained close ties to France and neighbouring countries. Since the early 1990s, Côte d'Ivoire has experienced coup d’etat and two civil wars, first from 2002–2007 and again, following disputed elections, in 2010-2011. At independence, Côte d'Ivoire had the strongest economy in West Africa, based largely on commercial agriculture for export, and it continued to develop this sector, particularly cocoa and coffee. A recession in the 1980s contributed to the increasing political unrest. Despite civil wars, falling global prices for agricultural products, and internal political pressures, the country remains the largest regional economy, largely based on agricultural and forestry product (including rubber) exports, and is the world’s largest exporter of cocoa beans. Employment opportunities attract large numbers of workers from neighbouring countries. Petroleum products also contribute to export earnings. Côte d'Ivoire has high average annual rainfall and a number of major perennial rivers. However, rainfall is not evenly distributed seasonally, and many rural areas depend on groundwater for water supply. Groundwater from the shallow coastal Quaternary aquifer is also the main source of drinking water supply in Abidjan and much of the coastal zone. Water and sanitation infrastructure was greatly damaged by the civil war that ended in 2007, particularly in the north, and much government and NGO effort in the years since has gone into rehabilitation of existing water infrastructure. Please cite this page as: Upton, Ó Dochartaigh and Bellwood-Howard, 2018. Côte d'Ivoire is in west Africa with a southern coast on the Gulf of Guinea. The country is largely flat, less than 500 m, with local relief. The west of the country is more hilly, with parts rising above 500 m, to a maximum of about 1200 m elevation. The south has many low lying areas and a few isolated or groups of low hills rising to around 650 m elevation. The southern coastal zone has an equatorial climate with the highest rainfall, at around 2,400 mm/year, and rainfall is fairly evenly distributed throughout the year. The centre of the country has a tropical climate, with average annual rainfall of around 1,000 to 1,400 mm, and two wet seasons: the main one starting in December and the smaller one from August to October. The north is drier, with average annual rainfall betweewn 400 and 1,000 mm, concentrated in a short rainy season from July to September. 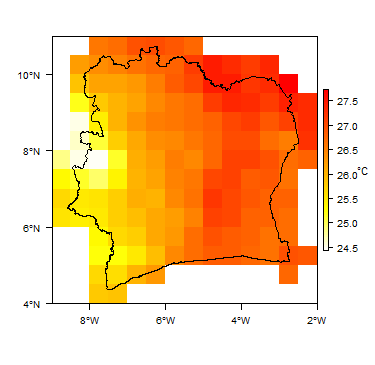 More information on average rainfall and temperature for each of the climate zones in Cote d'Ivoire can be seen at the Côte d'Ivoire climate page. There are four main rivers in Côte d'Ivoire: the Cavally, Sassandra, Bandama and Comoé, all of which flow from north to south, into the Atlantic Ocean. There are also several smaller coastal rivers, which also generally flow from north to south into the Atlantic, but some discharge into lagoons before they reach the coast. In the north, there are several tributaries of the Niger and the Black Volta rivers. The Niger tributaries flow northwards towards Mali. The highest river flows occur from April to October, with lowest flows in January and February. There are a number of dams on some of the major rivers, related to hydroelectric schemes. The south of the country is equatorial with forest; the centre is dominated by tropical forest; and the north is dominated by savannah vegetation. This section provides a summary of the geology of Côte d'Ivoire. More information is available in the report ‘Groundwater in North and West Africa: Côte d'Ivoire’ (UN 1988) (see References section, below). The geology map shows a simplified version of the geology at a national scale (see the Geology resources page for more details). - to the south is a deep basin, where the sedimentary infill reaches 4,000 to 5,000 m thick. There is a series of lagoons, part of an ancient hydrographic system, which have very thick mud deposits and are now submerged. Unconsolidated coastal sediments Quaternary The upper part of the sedimentary basin infill, especially in the 'low plateau' areas south of the lagoons, close to the shore, are Quaternary formations with a sand-clay continental formation about 20 m thick overlying a series of marine clays interbedded with sands, together about 10 m thick. Continental Terminal Cretaceous-Tertiary Subsidence of the coastal basin began in the Cretaceous and reached a maximum in the Pliocene (late Tertiary), but continues today (JICA). The lower part of the sedimentary infill in the coastal basin comprises detrital continental Tertiary (Miocene-Pliocene) formations - mostly coarse sands - and, in the deepest areas, Upper and Middle Cretaceous marine formations, mostly sandstone, including ferruginous sandstone, and clays. Together, these form the Continental Terminal formation (sometimes, the Cretaceous is treated as a separate aquifer). Examples of lithological (geological) logs of boreholes through the Continental Terminal can be seen in Bourgeois (1978) (Figure 1C, page 48). Birrimian Upper and Middle Precambrian Metamorphic rocks, mainly of sedimentary origin. These are generally schists, with meta-sandstones and meta-conglomerates in places. In places there are granitic intrusions, accompanied by volcano-sedimentary formations of tuffs, breccias, and green rocks. These form bands running from north-northeast to south-southwest, and are heavily folded, sometimes vertical. Pre-Birrimian Lower Precambrian The oldest basement formations include crystalline gneiss, granites and migmatites. They are most common in the west of the country (although migmatites are found everywhere). 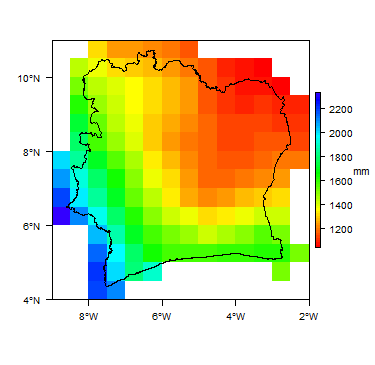 This section provides a summary of the hydrogeology of the main aquifers in Côte d'Ivoire. More information is available in the report United Nations (1988) (see References section, below). An early detailed overview of groundwater in Côte d’Ivoire (in French) can be seen in the report Notice Explicative de la Carte de Planification des Ressources en Eau de Côte d'Ivoire, du Ghana, du Togo et du Benin (Bourgeois 1978). A summary in English can be seen in the report Groundwater in North and West Africa: Côte d'Ivoire (United Nations, 1988). 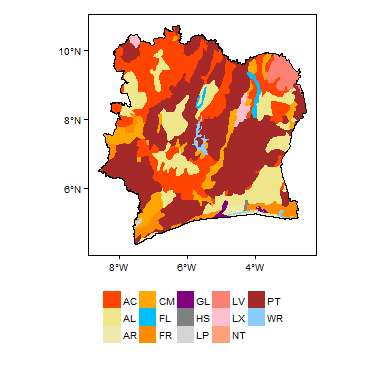 The most widespread aquifer type in Côte d'Ivoire is weathered and fractured basement rocks, which underlie most of the country. The narrow sedimentary coastal basin, with Cretaceous-Tertiary consolidated sedimentary rocks overlain by unconsolidated Quaternary sediments, contains two highly permeable aquifer zones at depth. Continental Terminal is the name sometimes given to the whole of this coastal basin aquifer, from Cretaceous to Quaternary, and sometimes to describe only the Quaternary, or only the Tertiary, or both the Cretaceous and Tertiary formations. Here, it is used to describe the Cretaceous-Tertiary aquifer in the coastal basin that underlies the Quaternary aquifer. The Quaternary aquifer is described separately below, highlighting its unconsolidated nature and high vulnerability. Coastal basin Quaternary The southern part of the coastal basin consists of Quaternary formations, including coastal and marine sands. In their upper part, these form a moderately to highly productive aquifer, capable of sustaining borehole yields of at least 5 to 50 m³/hour. In some places with very permeable coarse sands, a borehole yield of at least 210 m³/hour for a drawdown of 3.1 m was recorded (a specific capacity of at least 1600 m³/day/m) (Bourgeous 1978). Permeability values of 10-3 for the marine sands and 10-4 to 10-3 m/sec for clayey sands are given (Issiaka et al. 2006). Groundwater flow velocity in the aquifer is high and believed to be relatively uniform, as the sands are relatively homogeneous (Douagui et al 2012). In some places there is a clay layer underlying the sand aquifer, below which is often saline water. The aquifer is recharged by direct infiltration of rainwater, and recharge is high, with effective infiltration of 50 percent of rainfall. Fresh water lies in density equilibrium on a layer (or wedge) of salt water, or on impermeable strata such as a clay layer. Where there is no seawater intrusion, groundwater in the upper layers is fresh. Seawater intrusion can raise the salinity of groundwater in this aquifer significantly. Salt water at depth has salinity ranging from 100 to 2500 mg/l. Continental Terminal - coastal basin Cretaceous-Tertiary This aquifer is buried below the shallow Quaternary aquifer in the coastal basin, and they may be in hydraulic continuity. Groundwater flow is dominantly intergranular, and the aquifer is likely to be largely unconfined. Transmissivity is high, with values of up to and possibly more than 10,000 m²/day, and storage coefficients of 10 to 15 percent. Sustainable borehole yields may be on the order of 10 to 200 m³/h. Groundwater generally has low mineral content, with dry residue usually between 40 and 150 mg/l; calcium and magnesium of 1 to 4 mg/l; bicarbonate of 3 to 6 mg/l; and chloride of 7 to 14 mg/l. It is almost always acidic, with pH close to 4.5. Birrimian aquifers Upper and Middle Precambrian Most evidence on the groundwater potential of these aquifers is from the 'cocoa belt'. Near-surface weathering of these rocks typically produces argillaceous, clayey sediments, which have low permeability and do not contain much groundwater. The thickness of the weathered zone depends on the lithology of the rocks: in schists it is 45 m thick on average, but where schists are interbedded with sandstone or quartz, it does not exceed 30 m. Where the weathered zone is more than 40 m thick, there is typically very little groundwater; and where it is more than 60 m thick, groundwater is virtually non-existent. Groundwater is preferentially found in fractures in quartz seams, or in volcanic layers, and are more common where sandstone or quartz strata are present. In most cases, boreholes drilled in sands are between 15 to 20 and 35 to 40 m deep, and groundwater is usually found at a depths of 10 to 20 m below soil level. There is little groundwater at depths of below about 30 m. Specific capacity values are usually between 24 and 72 m³/day/m (a yield of 1 to 3 m³/hour per metre of drawdown). The argillaceous near-surface material must be cased out in boreholes to prevent fine particles blocking well screens. Groundwater has moderate mineral content, with dry residues of between 250 and 500 mg/l, sometimes up to 650 mg/l, and a pH close to 7 (neutral). Granito-gneiss aquifers Lower Precambrian Groundwater occurs here mostly in shallow weathered zones, where the rock has weathered to sand and gravel; and in deeper fractures in unweathered bedrock. Groundwater resources are therefore found in discontinuous localised aquifers. The weathered zone is 20 to 30 m thick on average, but sometimes as much as 60 m. Transmissivity values for this zone are in the order of 8 to 85 m²/day. Generally speaking, the most weathered (the most sandy and gravelly) zones, which have the highest permeability, are found at the base of the weathered zone. At the surface, there are usually sand-clay layers. Unweathered bedrock at the ground surface is rare. Annual fluctuations in groundwater level vary from a few metres to 6-10 m, with the smallest fluctuations in areas of low elevation. The high, intergranular permeability of the coastal Quaternary and Continental Terminal aquifers, combined with shallow groundwater tables, makes them highly vulnerable to contamination, both by seawater intrusion and by pollution from urban industry and domestic waste. Many studies have been done of the risks to and effects on groundwater, particularly in the Abidjan area (e.g. Douagui et al. 2012, Kouamé et al. 2013 and Issiaka et al. 2006). Seawater intrusion may be caused by falling groundwater levels, which themselves may be linked to intensive groundwater pumping and/or to rainfall variability (Oga et al. 2006). Groundwater from the Quaternary aquifer is the main source of drinking water supply in Abidjan and most of the rest of the coastal zone. Groundwater from shallow boreholes and hand dug wells in the basement aquifer is the main source of water in rural areas across the rest of the country. Many boreholes have been drilled in both rural and urban areas, mainly for domestic water supply. The Office of the High Commissioner for Hydraulics (HCH), created in 1996 under the supervision of the Prime Minister's Office, is responsible for national water sector policy. Its role is to put in place an adequate institutional framework able to take charge of water and sanitation-specific problems, and to ensure integrated management of water and sanitation. The Ministry of Economic Infrastructure, through its Department of Water (DE), plays a key role in developing policy on water resources. It is composed of three sub-divisions: i) the hydrology sub-directorate, ii) the urban hydraulics sub-directorate, and iii) the village hydraulics sub-directorate. However, the IWRM implementation process met with difficulties due to the civil war after 1999. Much work has been done since 2007 to restore water supply infrastructure and water management procedures, including starting to reactivate village-level water management committees. Records of drilled water boreholes are stored and managed in rural water supply subdirections within the Department of Water in the Ministry of Economic Infrastructure. A JICA (undated but post 2015) report records of a total of 17,532 groundwater wells and boreholes, of which 12,639 are boreholes and 4094 are hand dug wells. Most of these are in the Precambrian Basement aquifer, but a large proportion are in the coastal basin aquifers. A private enterprise, the Société de Distribution d’Eau de Côte d’Ivoire (SODECI), has been responsible for operation and maintenance of the Abidjan water system since 1959, the year before independence, and has been responsible for operation and maintenance of all urban water systems in Côte d’Ivoire since 1974. The following references provide more information on the geology and hydrogeology of Côte d'Ivoire. Bourgeois M. 1978. Notice Explicative de la Carte de Planification des Ressources en Eau de Côte d'Ivoire, du Ghana, du Togo et du Benin. BRGM / Agence d'Études de Géologie Appliquée a l'Étranger. JICA Report (date unknown but after 2015) - extract. Chapter 5 - Geology and Groundwater (of Côte d’Ivoire). Kouame KJ, Jourda JP, Biemi J, and Leblanc Y. 2008. Groundwater Modelling and Implication for Groundwater Protection: Case Study of the Abidjan Aquifer, Côte d’Ivoire. In: Adelana and MacDonald (eds.) Applied Groundwater Studies in Africa: IAH Selected Papers on Hydrogeology 13. Kouamé el al. 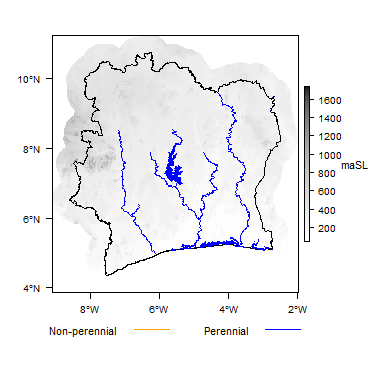 2013. https://pdfs.semanticscholar.org/efaf/9192096b978b14d291a31660d8314276f9a9.pdf Modeling of Groundwater Flow and Drawdown Evolution Simulation of Abidjan Aquifer (Côte d’Ivoire)]. Journal of Asian Scientific Research, Vol. 3 (4), pp 344-364. Lasm T, Razack M and Youan Ta M. 2008. 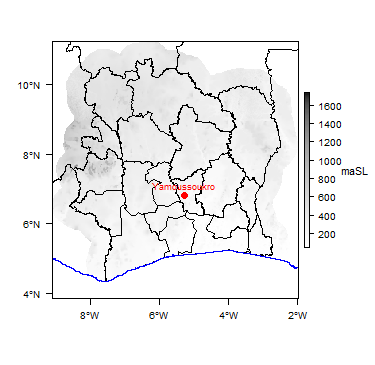 Geostatistical Assessment of the Transmissivity of Crystalline Fissured Aquifer in the Bondoukou Region, North-Eastern Cote d’Ivoire. In: Adelana and MacDonald (eds.) Applied Groundwater Studies in Africa: IAH Selected Papers on Hydrogeology 13. Oga MS, Marlin C, Dever L, Filly A and Njitchoua R. 2008 . 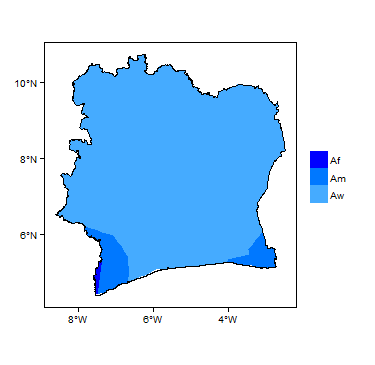 Hydrochemical and isotopic characteristics of coastal Groundwater near Abidjan. In: Adelana and MacDonald (eds) Applied Groundwater Studies in Africa: IAH Selected Papers on Hydrogeology 13, pp 371-389. This page was last modified on 21 February 2019, at 16:36.